Smart Dubai Office ... part of an initiative to transform Dubai into the world’s smartest and happiest city by 2021. Fitting out the offices of the technology arm of ‘Smart Dubai’ – an initiative to transform Dubai into the world’s smartest and happiest city by 2021 – was among the challenges that Summertown Interiors has successfully tackled and completed under a fast-track programme last year, says the leading UAE fit-out contractor. The Smart Dubai Office, which is due to achieve Leed (Leadership in Energy and Environmental Design) Gold certification, has been designed and fitted out to deliver on the client’s brief to create a space that reflects its progressive and smart organisational identity. Summertown Interiors, which specialises in green interiors, teamed up with Design Worldwide Partnership (DWP) to work on the 1,850-sq-m office located in Dubai Design District (D3), in a 14-week project timeline. The complex audio-visual and IT requirements, coupled by an immovable opening date, meant the project needed a fast-track programme. Summertown Interiors was chosen as the main contractor to do the complete fit-out of the Smart Dubai Office based on its consistent attention to detail, process-driven approach to project management and ability to deliver a high-specification project on time. Its green credentials were also a factor in its appointment. DWP’s design took inspiration from Dubai’s shifting sand dunes and creek to create organic structures while emphasising movement and fluidity throughout the office space. All joinery items were custom-built by Summertown. According to a spokesman for Summertown Interiors, the fit-out specialist brought this design to life by installing curved wooden ceiling panels, wooden oak floors, landscaped gardens and roped partitions. “All joinery items were custom-built by Summertown and would not have been possible without Summertown’s process-driven approach, craftsmanship, and attention to detail during the fit-out,” he says. Adhering to international environmental standards was extremely important, given the Dubai Government’s commitment to sustainable urbanisation. With sustainability lying at the heart of Summertown’s business model, it was tasked with managing the Leed certification process for the project. “To deliver the client’s fit-out ambitions in accordance with sustainability best practice, Summertown adopted several key processes including green waste strategies to minimise the environmental impact during the build – as a result, approximately 50 per cent of waste was recycled and sold to scrap dealers,” the spokesman says. An estimated 31 per cent of project purchases met sustainable criteria, while the daily tracking and monitoring of energy and water consumption enabled Summertown to implement necessary measures for any unexpected issues during the fit-out. It also provided complete transparency for the client. The high level of technology installed in the office for a seamless work environment required careful installation and testing. To ensure functional technology integration that met with the client’s quality expectations, Summertown hosted regular onsite client workshops as part of its progress reporting. Technology installed included a ‘virtual receptionist’ – an unmanned reception area that allows guests to send an SMS and email to the person they are meeting, while also acting as a dashboard for the power and water consumption in the office. Another feature is the all-in-one meeting room control pad for presentation display, lights and blinds, which also connect wirelessly to different devices like laptops, tablets and smartphones. This smart solution allows for easy meeting room management and collaboration with colleagues inside and outside the organisation. Curved wooden ceiling panels and wooden oak floors ... inspired by Dubai’s shifting sand dunes. The office was also designed to encourage collaboration via cleverly integrated, sharable ‘digital spaces’. Meeting rooms feature writable walls to help foster creativity and productivity within the workplace. Other elements include a café with a curved LED screen to broadcast live feeds of social media and events, an auditorium with flexible seating and quiet zones where Smart Dubai employees can choose to work, thanks to 24/7 wireless connectivity. For 20 years, Summertown Interiors has been among the UAE’s leading and most sustainable contractors, offering superior quality interior fit-out solutions. Reputed for its green expertise and exceptional client service, the company specialises in commercial, healthcare, and education projects for global Fortune 500 companies, government authorities and local businesses. The company has recently released its 2016/2017 Sustainability Report, prepared in accordance with the Global Reporting Initiative (GRI) – its second such report that highlights sustainability milestones for the company, reports on the impact of key material issues, and provides a benchmark by which to measure future efforts. The report outlines eight material issues identified through the analysis of environmental, social and ethical issues associated to the company and by reviewing stakeholders’ feedback. Of the eight material issues highlighted in the report, Summertown’s environmental performance has improved significantly with an 11 per cent reduction in water consumption, a 15 per reduction in its carbon emissions and 44 per cent of waste was recycled or recovered since 2015/16. Summertown continues to use the US Green Building Council’s Leed framework to measure and improve on its environmental performance. 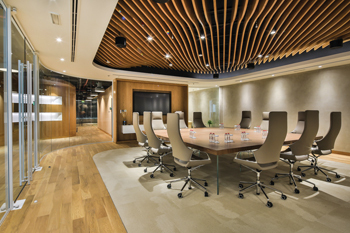 In 2009, the company was the first fit-out contractor to occupy Leed Gold-certified interiors in the UAE. In 2016, it was awarded the Leed Gold certification for its existing building’s operations and maintenance (Leed EBOM). “This report is our second sustainability report and highlights our continuing commitment to our own sustainability goals and our mission to help our clients achieve theirs; by creating inspiring workplaces to enhance employee health and happiness, and deliver operational savings,” he concludes.